Located in the residential area of La Sella Golf Resort located this beautiful Villa with breathtaking views of the Mediterranean coastline, the orange valley and the Segaria mountains. 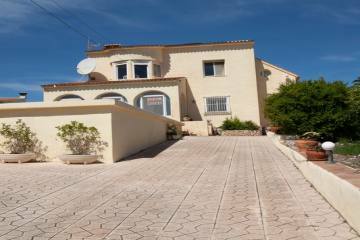 Great location between Denia and Javea, the shopping centre and the hospital. The property is on two levels and consists of the lower level with an open lounge and dining area with patio doors. Separated by two Tosca arches you have the built-in fully fitted kitchen and a storage area underneath the staircase and a shower room. All this area is on one level with the pool and a good size terrace. The upstairs is the main entrance with a patio in the front, a hall, laundry area and two double bedrooms, each with an integrated washbasin unit and access to the balcony and a full bathroom. There is further storage provided by a room with access from the pool terrace. The underbuild has possibilities to be converted into a living space. Easy to maintain garden and a carport. The furniture is included except the beds.